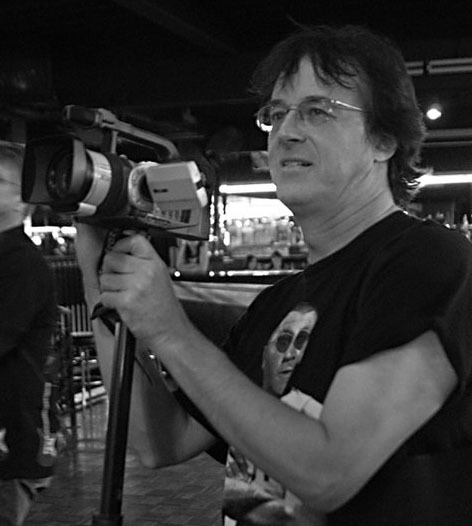 Eric Predoehl is a multi-media professional whose talents have been utilized as a producer, director, writer, camera operator, editor, photo-journalist, graphic designer, AV technician, and idea generator. Fascinated by new ideas, unique stories and the ever-evolving role of technology, Eric continues to be excited by the San Francisco Bay Area he calls his home base. Growing up as a military brat living in a variety of diferent locations in the USA and Europe, Eric had a taste of cultural diversity at an early age. When he attended college, receiving a B.A. degree in Radio-TV Broadcast from San Jose State, and an A.A. degree in Professional Photography from De Anza College, Eric was also managing an independent record label, adminstrating all aspects of the business including promotions, manufacturing, distribution, and tour management. During his time in college, he also participated in programming, promotions, journalism and photography at KFJC Radio, a nationally-acclaimed college radio station known for a lot of news-breaking activities. It was at KFJC where he collaborated on a “LOUIE LOUIE” marathon, where he met the author of this song, Richard Berry, a man who was struggling to survive with welfare benefit even as his compositions sold millions of records. Eric’s life was forever changed when he had the foresight to bring a video camera to documment what turned out to be a rather historic event. Not long after this momentous event, Eric was approached by an independent video producer that wanted to videotape an event that Eric was producing in San Francisco. The independent producer was Jesse Block, who became a good friend and fellow collaborator in the world of video production. Since that initial meeting over twenty years ago, Eric and Jesse have continued to work together on a variety of diferent media productions, taking them to a lot of places in California and the United States, with an occasional visit to Europe for a working vacation. In 2003, Eric was involved with the Howard Dean presidential campaign. Starting off with the now-historic Sacramento speech before his official announcement, Eric became one of the earliest video producers actively documenting the campaign, using the powers of the internet and grass-roots activism to promote Dean’s candidacy. Ultimately, Dean’s efforts were crippled by a renegade audio recording, but the Dean campaign was truly a groundsbreaking effort that changed the way political campaigns used the power of the internet. Music continues to a major driving force for much of Eric’s most exciting projects. When the Blues Express media company decided to develop a syndicated televsion program about blues music, Eric was hired as a producer, writer and senior researcher. He also wrote liner notes for three different Blues Express CD releases. In the course of his ongoing LOUIE LOUIE research and documentary production, he’s also collaborated with Ace Records of UK, helping them secure direct access to some previously unreleased master tape libraries. Under the OctaLouie umbrella, Eric Predoehl continues to collaborate his pal Jesse Block to produce a wide variety of video productions. They’ve produced broadcast televison programming, music documentaries, concert videos, live event presentations, corporate motivational programming, commercials, public service announcements, and more…. You can also check out Eric’s YouTube channel – EPLOUIE.